Here are the Millennium Sunday guidelines on how to report playoff scores to the Daily Times. Please click the link below to print the Millennium Sunday Softball League scores & highlights sheet that can be used to help with reporting scores to the Daily Times. The winning team(s) are responsible for getting the results and the game highlights to The Daily Times before 6:00 p.m. so that they can be printed in the paper on the Monday following the games. The Daily Times does not have a full staff working on Sundays, so the results cannot be taken over the phone or faxed - they MUST be emailed. 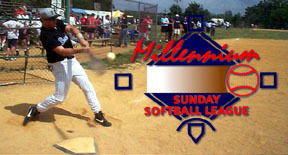 NOTE: Please include Millennium Sunday Softball League ONLY in the subject line of the email.